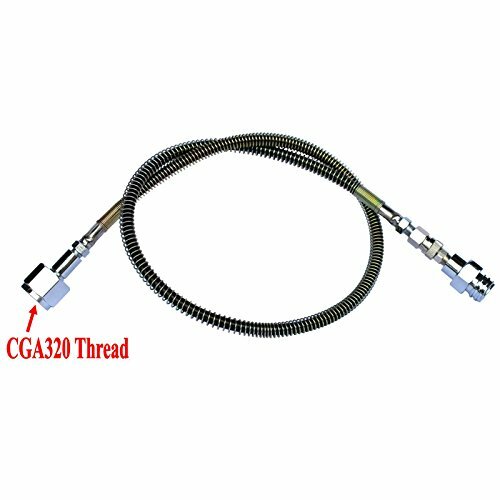 CO2 SodaStream/Soda Club To External CGA320 Tank Direct Adapter And Hose Kit (36'' Spring Protector Hose) by GFSP at Tim Park Design. Hurry! Limited time offer. Offer valid only while supplies last. It connect a large CO2 tank and SodaStream machine! Item only fit picture demonstrated SodaStream thread ,not fit most of Australia SodaStream machine. Adapter Material : Brass / Surface Polished Plating. Stainless Steel Braided Hose Line;High pressure hose with spring protector;Black/Blue High Pressure Hose,within 4500psi air pressure.Hose Length:24"/36"/72"
If you have any questions about this product by GFSP, contact us by completing and submitting the form below. If you are looking for a specif part number, please include it with your message. External tank direct Adapter Hose Kit for home soda machine, seltzer water.